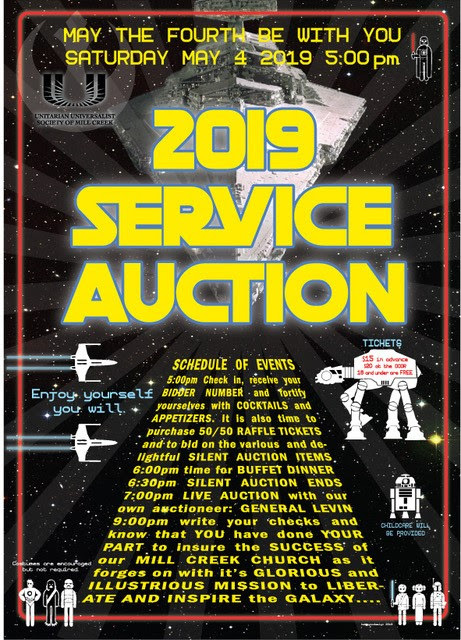 What exactly is a Service Auction? It is a fun and entertaining evening when Mill Creek members and friends gather together for a delicious meal and bid on donated items in live and silent auctions. The event serves as Mill Creek’s largest fundraiser. Anyone can make a donation, such as a service (think music or cooking lessons, tutoring, lawn care, personal IT consultation, transportation), an experience (such as themed dinners, picnics & BBQ’s, garden tours, guided hikes, musical performances, beach weekends and vacation packages), or an item (like retail gift cards, food-of-the-month offerings, gift baskets, hand crafted items). The winning bidder receives the item, experience or service, and the church keeps the proceeds. What if I’m unable to attend the auction … can I still donate something? Absolutely! The auction won’t be successful without fun, interesting and creative donations. Use your imagination! How do I make arrangements for a donation? Contact David Bonner (contact information available on Realm) with the information and details about your donation. He will assist you with determining a fair market price and add it to the catalog of offerings which bidders can preview a few days prior to the auction. How do I pay for something at the auction? We can accept checks or cash. Remember to bring your checkbook with you! What if I’m unable to donate something … can I still attend the auction? Certainly! Come and join us for a fun evening and see what it’s all about. Tickets – a bargain at $15 each – will be available for purchase starting this Sunday, March 31st. Tickets will also be available at the door on the night of the event for $20 each. What if I can’t attend the auction or donate an item or service … can I make a financial contribution instead? Of course! Contributions are always gratefully accepted. For further questions or information, contact our event organizer, Helen Springer (contact information available on Realm).